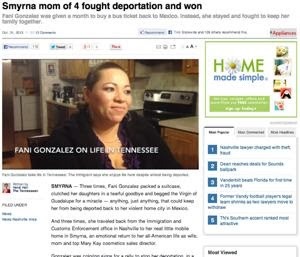 Beyond the subject matter itself, what impressed me most about Heidi Hall's recent story in the Tennessean about the immigration struggle of Fani Gonzalez was how Hall wrote it. Specifically, Hall used a full complement of the English language. Hall, General Assignment Reporter/Editor at the Tennessean, did not fall into the in vogue trap of the immigration beat of U.S. journalism, which would be to disproportionally and monotonously use a two-word legal label* to describe Gonzalez throughout the story. Three times, Fani Gonzalez packed a suitcase, clutched her daughters in a tearful goodbye and begged the Virgin of Guadalupe for a miracle — anything, just anything, that could keep her from being deported back to her violent home city in Mexico. From these 41 introductory words, the reader learns Gonzalez's name and some hints of her family, religion, immigration status, and nationality. It's information and color, not monotony. Writing like this needs to return to the immigration beat. Kudos to Hall. *either "undocumented immigrant" or "illegal immigrant"
**The words "undocumented immigrant" show up 5 times in Hall's 1461-word piece and describe Gonzalez's family only once.